"All on the Line" - Daniel Moore's tribute to Steadman Shealy. 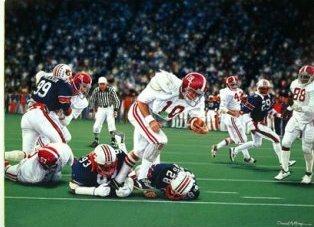 "All on the Line" commemorates the dramatic come-from-behind win against Auburn during the 1979 season. Steadman Shealy's scamper into the end zone capped an 82-yard fourth quarter drive giving Alabama a 25-18 victory over Auburn.